As I stand down as RedBerry Secretary at this AGM, and Dorothy has asked me to be this months Guest Quilter!! I have decided not to continue as Secretary at this time because I have the opportunity to be part of an art exhibition with a painter friend on mine and I want to focus on this project, so lots of work ahead!! 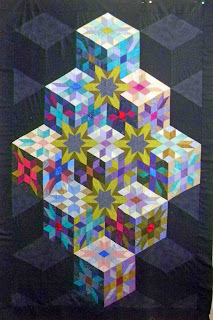 I made my first quilt in the 1980’s but only got into serious quilt making when I retired from full time work in the mid 90’s. Since then I have made many quilts for family and friends and myself and have tried many techniques and styles. I eventually decided that my favourite technique is applique, in all its forms. After moving to Berry in 2005 I started to develop my own designs but soon realised that I didn’t have room or wall space for many more large quilts !! I decided it would be good to learn more about design and this led me into making art quilts . In this area of quilting there are also many techniques and styles to try! !